I've always felt different, like a fish out of water, says author Jeff Stone. I suppose that's why I write. I get to sit on the shore and watch the various schools swim by, imagining which group I might actually fit in with. Like the main characters in his award-winning Five Ancestors series, Jeff was an orphan. He was adopted as an infant by wonderful parents, but he always had a strong urge to uncover the secrets of his past. He began searching for his birth mother when he turned eighteen, and found her fifteen years later. A year after that, he found his birth father. 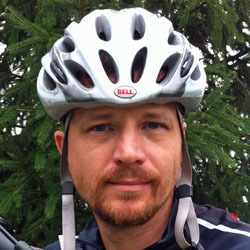 Also like his characters, Jeff practices the martial arts and rides bikes a lot. He holds a black belt in Shaolin Do Kung Fu, and often trains in other styles as part of his research for his books. In 2005 he traveled to China with the Shaolin Do grandmaster to take his black belt test inside the legendary Shaolin Temple. Fortunately, he passed. Jeff has traveled to China on other occasions, most importantly in 1996 for a traditional Chinese wedding ceremony to his wife in her native Hong Kong. (He passed that test, too.) Jeff thinks his English skills are pretty good, but his Chinese still needs a lot of work. As for cycling, Jeff has two mountain bikes and a road bike. He borrowed a cyclocross bike from Lance Armstrong's bike shop (Mellow Johnny's) and road it around downtown Austin, TX, while researching PHOENIX. He also road his mountain bike in the surrounding hills with a couple guys from the shop (and got schooled by a 14-year-old intern). Jeff says he gets bored easily, and to prove it lists some of the jobs he's held since graduating from Michigan State University with degrees in English and Journalism: maintenance man; concert promoter; photographer; editor; technical writer; graphic designer; industrial filmmaker; web developer; ballroom dance teacher; college English instructor; and marketing director for architectural firms that design schools, libraries, and skateboard parks. 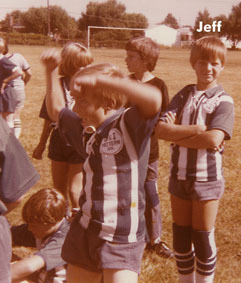 These days, Jeff writes and speaks with kids full-time. It's the longest single job he's ever had. Perhaps he's finally found where he belongs. For more information about Jeff, check out his RESEARCH page.